April marks the 151st anniversary of the Battle of Shiloh, which was fought on the banks of the Tennessee River a few miles north of the Tennessee-Mississippi state line. On April 6, the Confederate Army of the Mississippi led by General Albert Sidney Johnston launched a surprise attack on the encampment of the Union Army of the Tennessee commanded by Maj. Gen. Ulysses S. Grant. 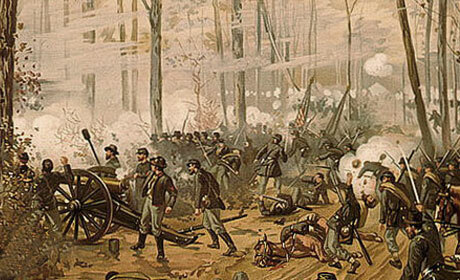 The Battle of Shiloh began before dawn on Sunday, April 6. Col. Everett Peabody, who commanded a brigade in Brig. Gen. Benjamin M. Prentiss' division, sent a skirmish line of the 25th Missouri Infantry into the Fraley cotton field in search of Confederates. The Union skirmishers encountered the 3d Alabama Battalion on picket duty, and a firefight ensued. Around 6:30 A.M., Confederate Lt. Gen. William J. Hardee's mile-long line of battle emerged from the tree line and began pushing back the Missourians. The skirmishers were soon joined by the rest of Peabody's brigade, and the Federals conducted a fighting retreat to their camps. This Confederate army commander was killed at Shiloh on April 6, 1862. In all of American history, he is the highest-ranking American military officer ever to be killed in action. Hearing the opening shots of the battle, General Johnston mounted his horse. 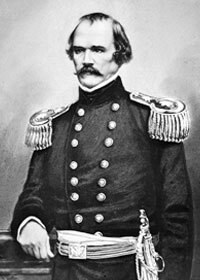 "Tonight we will water our horses in the Tennessee River," he told his staff, and then rode out to find his army's right flank. Johnston had decided to forego overall direction of the battle in favor of leading the Confederate assault on the right, where he believed his direct intervention would have the greatest impact. He entrusted deployment of the reserves to his second in command, General P.G.T. Beauregard, who remained in the rear on the Corinth Road. The divisions of Prentiss and Maj. Gen. William T. Sherman bore the brunt of the Confederate onslaught; caught by surprise, most Federals abandoned their camps without a fight and fled north. Some of the men fought bravely but were overwhelmed by superior numbers. Among the Union casualties was Colonel Peabody, who was wounded three times before the fourth bullet killed him around 9:00 A.M. The Confederate attack soon bogged down as units lost cohesion advancing across broken terrain, and as soldiers broke ranks to loot the Union camps. In the bivouac of the 18th Wisconsin Infantry, General Johnston encountered a lieutenant loaded down with spoils. "None of that, sir," Johnston roared, "we are not here for plunder." Seeing the mortification on the young officer's face, Johnston picked up a battered tin cup. "Let this be my share of the spoils today," the general told the lieutenant, and then continued on his way. With the rout of Prentiss' division, the triumphant Confederates appeared to have an open path to Pittsburg Landing. But reports of a Union division beyond the Confederate right flank induced General Johnston to order a halt while he shifted two brigades to the extreme right. The Union "division" proved to be an isolated brigade commanded by Col. David Stuart�hardly a threat to the Confederate assault but an unexpected obstacle nonetheless. In any event, the Confederates waited for the brigades of Brig. Gens. James R. Chalmers and John K. Jackson to march into position and attack. 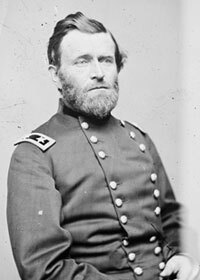 They easily drove back Stuart, but the delay enabled the Federals elsewhere on the battlefield to rally. 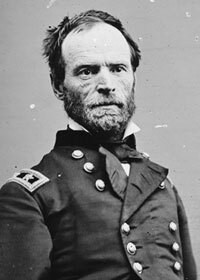 On the Union right, Sherman recovered from his nasty surprise and conducted a stout defense of the ridgeline around Shiloh Church. He deployed his two remaining brigades in a V-shaped line, augmented by artillery, and held four Confederate brigades at bay for almost two hours. Once again, the Confederates' superior numbers overwhelmed the Federal defenders. 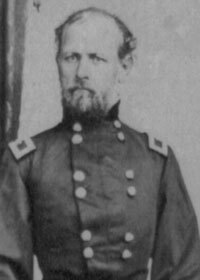 Sherman's troops slowly fell back to the Crossroads (the intersection of the Corinth-Pittsburg and Hamburg-Purdy Roads), where Maj. Gen. John A. McClernand's division formed on Sherman's left to bolster the Union center. On the Union left, the divisions of Brig. Gens. Stephen A. Hurlbut and W.H.L. Wallace marched from their camps near Pittsburg Landing and deployed along a narrow wagon trace bordering the Bell and Duncan fields that became known as the Sunken Road. (Wallace went into position on the right to support Sherman and McClernand while Hurlbut attempted to buttress Stuart's brigade on the left.) The road passed through a thicket of oak trees and underbrush that soldiers dubbed the Hornet's Nest because of the incessant whizz of bullets and shrapnel. The remnant of Prentiss' division fell back to this point and formed a salient between Wallace and Hurlbut. Starting at noon, Bragg launched no fewer than eight frontal assaults against the Hornet's Nest; Col. Randall L. Gibson's Louisiana brigade alone attacked four times into the dense thickets and lost one-third of its strength. While Bragg hammered away at the Hornet's Nest, General Johnston led four Confederate brigades in an assault on Brig. Gen. John McArthur's brigade anchoring the Federal left flank. Although the Southerners drove McArthur back, their success proved costly. About 2:15 P.M., while following the Confederate line of battle, General Johnston received a wound in the right leg. At first he seemed unaware of the injury, but the bullet had severed an artery, and he soon bled to death�a possible victim of friendly fire. With the loss of Johnston's leadership, the Confederate advance on the right sputtered out. The Federals manning the Sunken Road position managed to hold out until late afternoon, when the collapse of Union forces on either flank left them isolated. As the rest of the Federal line fell back, the Confederates surrounded the Hornets' Nest salient and captured over 2,000 Union soldiers, including General Prentiss. General Wallace was mortally wounded while trying to escape. But the desperate stand at the Hornet's Nest bought precious time for Grant to cobble together a strong defensive line on the high ground around the landing. Sherman held the right of the new line, McClernand anchored the center, and the remnants of several Union units manned the left. Grant buttressed the line with over fifty pieces of artillery, as well as the big guns of the timberclads USS Lexington and USS Tyler anchored nearby. 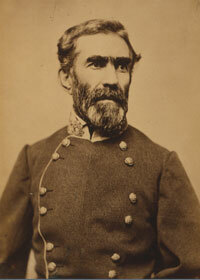 General Beauregard, meanwhile, learned of Johnston's death and assumed command of the Army of the Mississippi. At nightfall Beauregard called a halt to the Confederate offensive, confident that he could finish off Grant's army in the morning. This decision spurred a postwar debate over the "lost opportunity at Shiloh"; Johnston's advocates maintained that he would have pressed the attack against Grant's final line and won the battle. In making their case, they conveniently ignored the strength of Grant's position and the arrival of reinforcements at Pittsburg Landing, including Brig. Gen. William Nelson's division of Maj. Gen. Don Carlos Buell's Army of the Ohio and Maj. Gen. Lew Wallace's division of Grant's army. Johnston's apologists also failed to take into account the grit and determination of the Union commander. That night, Sherman found Grant standing under a large oak tree, holding a lantern and smoking an ever-present cigar. "Well, Grant, we've had the devil's own day," Sherman said. "Yes," Grant replied between puffs. "Lick 'em tomorrow though." On the morning of April 7, the heavily reinforced Federals launched a counterattack and slowly drove back the outnumbered Confederates. By dusk, the Southerners were retreating toward their base at Corinth, Mississippi, about twenty miles to the south. The Battle of Shiloh resulted in over 24,000 Union and Confederate killed, wounded, and missing, exceeding the casualty count of all previous American wars combined. The carnage shocked Northerners and Southerners alike, shattering any lingering illusions that the war would be a relatively bloodless affair. The Civil War would grind on for three more years and result in over 620,000 deaths.